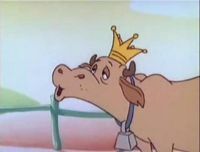 The Royal Cow is a large, brown cow wearing a crown which was once the pet of Princess Toadstool. In The Super Mario Bros. Super Show! episode "Mario and the Beanstalk", Princess Toadstool, needing one hundred Gold Coins to save the closing Mushroom Kingdom Orphanage, makes the decision of selling the Royal Cow; after making this decision, Princess Toadstool entrusts Mario and Luigi with selling the Royal Cow. Taking the Royal Cow to a cow lot, Mario and Luigi begin trying to sell it to the lot's owner, Dealin' Delbert, who keeps trying to convince Mario and Luigi to trade their cow for several old and sick looking ones. Eventually, Dealin' Delbert makes a "special deal" with Mario and Luigi, trading them something special for the Royal Cow. It is later revealed that Mario and Luigi had, in actuality, traded the Royal Cow for three small garbanzo beans; though Toad had originally planned on traveling to Dealin' Delbert's cow lot to get the Royal Cow back, he, along with Princess Toadstool, Mario and Luigi, are sidetracked by a giant beanstalk which had grown in their yard; the Royal Cow is subsequently never reclaimed. This page was last edited on September 7, 2018, at 22:11.